Browse > Home / News / What is happening at the U.N.? What is happening at the U.N.? 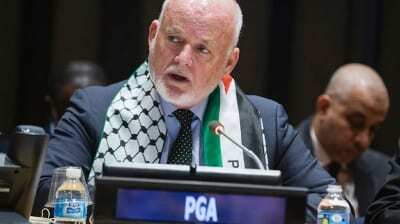 Last week, the President of the UN General Assembly, Peter Thomson, wore a Palestinian flag as a scarf to mark the UN’s “International Day of Solidarity of the Palestinian People”, a day set in the UN calendar for 29 November. The following day, six Arab-backed anti-Israel resolutions were passed. Surely it should be the Syrian owners of the Golan who decides what happens there?…..